Sitting in a store completely surrounded by sneakers makes me feel calm. To the untrained eye, each of these shoes look pretty similar, but to the aficionado, they’re not. I got into trainers from collecting basketball cards as a kid. I loved how cool the shoes looked on the NBA players’ feet, and began to appreciate the individuality of each sneaker. Man, I miss basketball cards. The fascination with sneakers can often become an obsession. At its extreme, it can dictate holiday plans, with the express purpose of trawling rare trainer shops in Tokyo or New York or London for the exclusive limited edition releases. 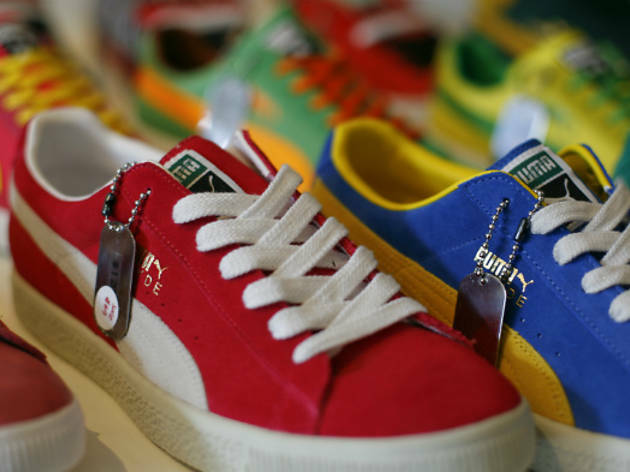 Thankfully, Sydney has its own treasure trove of trainers by the name of Footage – a dealership on Burton Street, not far from the corner of Crown and Oxford Streets in Darlinghurst. Footage supports a culture that feeds off individuality and self-expression, by providing styles and colourways imported direct from the US and Japan that are inaccessible to the rest of the city. The store sits alongside other clothing boutiques that form a mini streetwear district, which was owner Phil Koh’s vision when he opened his shop in October 2003. He wanted to create a community of cool, a block of stores where people could come and find items that are not necessarily available elsewhere in a city bursting at the seams with mass-produced apparel. This vision has blossomed with the subsequent opening of the Carhartt, Feit, Supply and An:other stores, as well as the Outré gallery, in recent times. The aesthetics of the store are clean and crisp with completely white surfaces detailing the store from shelf to counter. This polished look places greater emphasis on the products that are on display. There is no branding on the walls allowing each product to share the limelight. As for the kicks the store stocks; as well as being unique to Footage the selection on offer is quite varied. 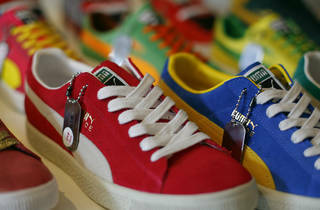 Sneaker aficionados can obsess over Nike, BAPE, Converse, Alife, Vans, Puma and Adidas – to name just a few. By providing a healthy range of styles Phil ensures that the shoes available appeal to a broad range of people. Though Footage’s focal point is their range of sneakers, they also carry clothing, sneaker-related accessories and collectable toys that reflect the eclectic mix of clientele. It’s a casual store that encourages folks to drop buy and chat, while looking through the range. On any given evening you fi nd Phil and his mates hanging out on crates outside the store, chatting. They’re open till 7pm most days, they don’t bite and they sure do know their trainers, so stick your head in.